It looked bad for Lake Forest. Stevenson jumped out to a 19-0 first-quarter lead against visiting the Scouts in a North Suburban Conference contest on Feb. 3. It got better — for LF. In fact, it ended up being a winnable game for the Scouts (8-13, 3-5) — LF trailed by only three points, 33-30, with 2:28 left in the fourth quarter — before they eventually succumbed 39-34. “They came out on fire and took it to us,” said LF head coach Phil LaScala. “They’re a skilled team. But, to their credit, the Scouts rallied. They countered Stevenson’s 19-0 run with their own 8-0 run to start the second quarter. And then, the Scouts went on a 10-0 run to open the third quarter. Senior Ben Gibson ended up with a phenomenal game: 20 points, 7 rebounds, 2 assists. He converted a couple of scoop layups and went on a personal 7-0 run to start the second half. He also had a seven-point fourth quarter, including a three-pointer on top and a nifty basket on a baseline drive. Gibson’s pass of the night went to Tommy Hanson with 2:28 left in the game. In a crowded lane, Gibson flipped an interior pass to Hanson, who was cutting down the baseline. Hanson took it in stride and went up strong to cut Stevenson’s lead to 33-30. LF’s chance of making a complete comeback might’ve gone by the wayside, when senior center Mead Piper (9 points) fouled out of the game with 2:53 left in regulation. — Glenbrook South saw its record dip to 7-15 on Feb. 3. The Titans went on the road and lost a close decision to Lane 47-43. Jimmy McMahon (10 points), Mac Hubbard (9 points) and Gavin Morse (8 points, 3 charges taken) led GBS. — Connor Barrett came up big on both ends of the court. The Loyola junior not only tossed in a team-high 23 points in his team’s 58-41 road win at Bishop McNamara on Feb. 2, but he also also took two charges. And he pulled down five rebounds. The Ramblers, who improved to 21-3 overall, also received solid showings from Kevin Cunningham (17 points, 6 assists), Pete Mangan (8 points, 6 rebounds) and Bennett Kwiecinski (8 points). — Highland Park picked up a CSL North win over visiting Vernon Hills 49-28 on Feb. 2. Senior guard Ziv Tal collected 17 points to lead the Giants (13-8, 7-1). The team’s other stat leaders included Jonny Koenig (8 points, 4 steals), Daniel Michelon (6 points, 3 steals, 2 assists), Jack Greenwald (5 points) and Noah Shutan (3 assists, 2 steals) and Tyler Gussis (5 steals, 2 assists, 2 rebounds). — Win No. 20 is in the books. The Ramblers (20-3) were led by Connor Barrett (13 points, 7 rebounds, 3 assists), Peter Mangan (7 points, 7 rebounds, 3 assists, 4 steals), Bennett Kwiecinski (7 points), Jordan Kwiecinski (5 points, 3 assists) and Quinn Pemberton (4 assists). — Sparked by Max Knebelkamp’s 19 points, Glenbrook claimed a 50-46 road win at Mundelein on Jan. 30. It was the 13th win of the season for the Spartans. — It’s been awhile for Glenbrook South. The Titans (7-13, 0-7) snapped a five-game losing streak by edging visiting Lake Forest 39-38 on Jan. 30. It was their first win since the final game of the Wheeling Hardwood Classic on Dec. 30. The Scouts (8-12, 3-4) had been going good. The entered the contest with a three-game win streak. LF’s Ben Gibson finished the game with 12 points, while Jimmy McMahon led the Titans with 13 points. GBS also received nine points from Dominick Martinelli, seven from Stefon Boyd and six from Will King. Fans of Lake Forest basketball had to love what Mead Payne accomplished on Jan. 24. The senior center tallied 21 points and pulled down eight rebounds to lead the Scouts to a road win over Waukegan 58-48. Payne especially was effective at the foul line: 11-for-12. Ben Gibson wasn’t too bad, either. The LF senior forward hit 8 of 14 shots to finish with 20 points. He also was credited with four rebounds. The Scouts (7-11, 2-4) have started to put things together. The team beat Mundelein on Jan. 20 and lost by only four points to Zion-Benton on Jan. 12. They are 2-2 since the holiday break. 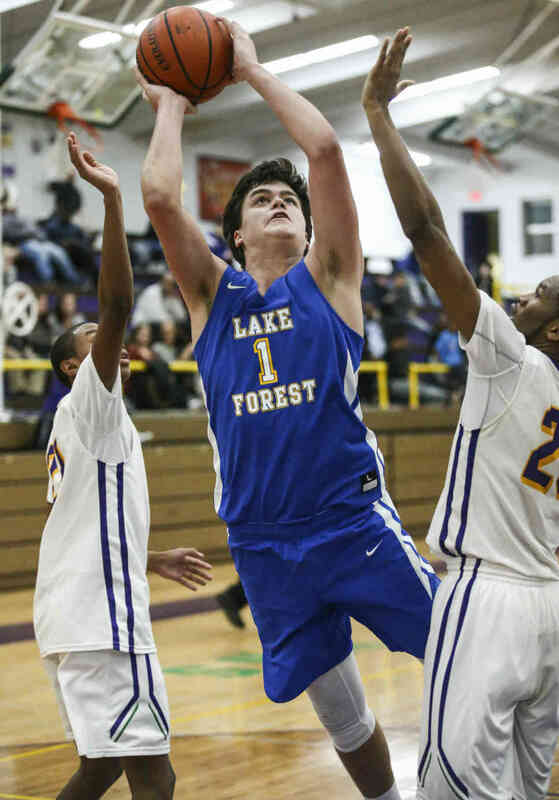 LF’s other stat leaders against Waukegan included Jed Thomas (5 points, 5 rebounds, 3 steals), Jake Fisher (4 points, 3 rebounds), Kyle Waggoner (4 points, 4 steals) and Sean Trkla (6 rebounds, 2 assists). Waukegan is now 10-8 overall and 3-4 in the North Suburban Conference. — Highlighted by Brandon Weston, Lake Forest Academy topped visiting CICS Longwood 76-55 on Jan. 26. Weston, a freshman, tallied 23 points for the Caxys, who improved to 14-7 overall. He had dunk in the third quarter off a feed from junior guard Bellamy Marcus. LFA’s other leading scorers were seniors Matey Juric (13 points) and Vasilije Vukmanovic (11 points). Juric had an impressive steal and stuff in the second quarter. He also made two three-pointers. — Evan Barnes (12 points, 4 rebounds, 2 steals), Kellen Witherell (10 points, 6 rebounds), Max Knebelkamp (8 points, 5 rebounds) and Mike Roane (8 points, 4 rebounds, 4 assists) led the way as Glenbrook North went on the road and beat Vernon Hills 48-37 on Jan. 26. The team is now 4-3 in CSL North action. — Dominic Martinelli tallied 16 points and Will King added 13 but it wasn’t enough as Glenbrook South dropped a 58-36 decision to visiting Niles North on Jan. 26. — Loyola topped visiting De La Salle 63-47 on Jan. 26 to move its record to 18-3 overall and 5-1 in league play. The Ramblers were paced by Bennett Kwiecinski (13 points, 4 rebounds), Peter Mangan (12 points, 5 blocks, 5 assists), Kevin Cunningham (11 points, 5 assists), Connor Barrett (11 points, 2 steals) and Quinn Pemberton (7 points). — Senior forward Griffin Ryan scored a team-high 15 points to lead New Trier to a 47-31 victory over visiting Niles West on Jan. 25. The Trevians improved to 15-3 overall and 5-1 in the CSL South. Glenbrook South did have it going in a nonconference loss to host Prospect 62-36 on Jan. 23. Dominick Martinelli had 11 points for the Titans (6-12, 0-6). — Ziv Tal continues to impress. The Highland Park senior guard tossed in 25 points in his team’s 54-43 victory over Lindblom in an invite game at Hyde Park Academy on Jan. 20. Fellow senior guard Daniel Michelon tallied 15 points for the Giants (10-7, 5-1). 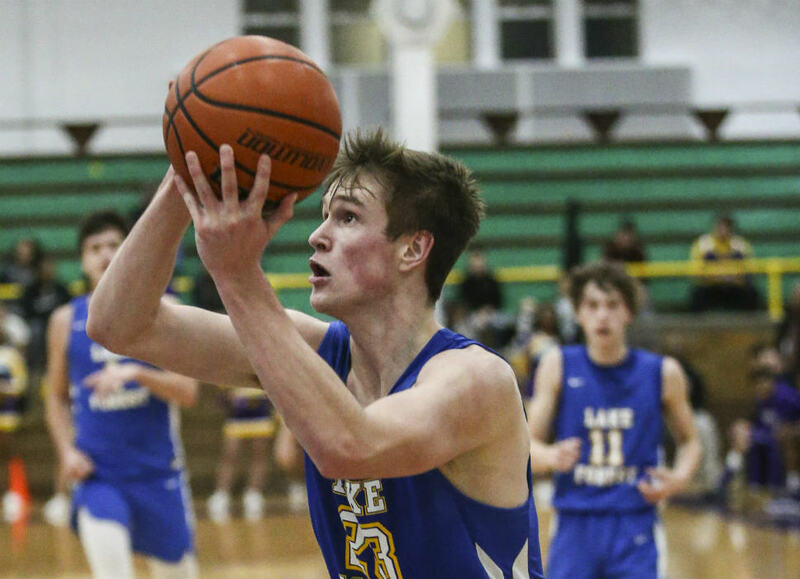 — Mead Payne stepped up nicely as Lake Forest got back on the winning track with a 56-38 triumph over visiting Mundelein on Jan. 20. Payne ended up with 13 points, six rebounds and two assists for the Scouts (6-11, 1-4). LF also received solid efforts from Ben Gibson (12 points, 5 points, 2 assists), Kyle Waggoner (8 points, 4 rebounds), Jack Van Hyfte (8 points, 3 rebounds) and Jake Fisher (4 points, 5 assists). — Max Knebelkamp turned in another solid effort and helped Glenbrook North defeat visiting Maine East 58-53 on Jan. 19. The senior guard went 7-for-9 at the foul line to finish with a team-high 16 points. He also had four assists. GBN (11-6, 3-3) also received solid efforts from Evan Barnes (13 points, 3 rebounds), Kellen Witherell (13 points, 3 rebounds) and Brian Johnson (8 points, 5 rebounds). — The Jesuit Cup remains in Loyola’s possession. LA held on to beat St. Ignatius 37-36 at Wintrust Arena in Chicago on Jan. 19 to retain the prized cup for another year. With the close win, the Ramblers improved to 17-3 overall and 4-1 in Chicago Catholic League Blue Division. Kevin Cunningham (10 points, 6 rebounds), Connor Barrett (10 points), Peter Mangan (7 points, 6 rebounds, 3 assists) and Bennett Kwiecinski (6 points) led the way. — Maine West came out on top in this CSL North showdown. The host Warriors edged Highland Park 48-45 on Jan. 19. Both teams are now 5-1 in league action. Daniel Michelon was HP’s leading scorer with 15 points. The senior guard also had three assists. Ziv Tal wound up with 10 points, two assists and two steals. The team’s other stat leaders included Lucas Fleisher (6 points), Andrew Natinsky (5 points), Jonny Koenig (5 points, 2 steals) and Noah Shutan (5 assists, 4 rebounds, 3 steals). Noah Osher (14 points) and Matthew Samuelson (12 points) led New Trier in its 47-29 victory over Amundsen on Jan. 16. It was the fifth straight win for the Trevians, who improved to 15-3. New Trier found a way to rebound from its tough overtime loss to Evanston on Jan. 12 by going 4-0 in the Rockford Jefferson MLK Tournament. On Jan. 13, the Trevians (14-3, 4-1) won two games. First, they took care of Rockford Guilford 71-42. And then, sparked by a 28-point effort by Griffin Ryan, they downed Johnsburg 65-50. On Jan. 15, NT wrapped up the four-game set with victories over Elgin Larkin 61-42 and Harlem 67-49. In the win over Larkin, the Trevians were led by Ryan (16 points), Andrew Kirkpatrick (13 points), Brian Conaghan (12 points) and Ciaran Brayboy (9 points). — Kellen Witherell came up with 17 points and seven rebounds, but it wasn’t enough as Glenbrook North dropped a 64-57 decision to visiting Maine West on Jan. 12. The Spartans (10-6, 3-2), who were outscored 38-26 in the second half, also received solid showings from Sean Merrigan (12 points, 5 rebounds, 2 steals), Evan Barnes (10 points, 4 assists), Max Knebelkamp (9 points) and Mike Roane (4 points, 5 rebounds). — A tough one for Glenbrook South. Looking for its first win in the CSL South, Glenbrook South ended up falling to host Niles West by one point, 40-39, on Jan. 12. Will King and Jimmy McMahon tallied 10 points apiece for the Titans (6-10, 0-5). Mac Hubbard came up with five rebounds. — This one was all Highland Park. The Giants cruised past host Deerfield 50-26 on Jan. 12 to stay undefeated in CSL North action (5-0). Senior guard Ziv Tal connected on 7 of 11 three-pointers on his way to a 27-point performance. He also had four rebounds and three steals. The other key contributors for HP (9-6 overall) included Jonny Koenig (8 points, 2 assists) and Noah Shutan (6 points, 5 assists, 3 rebounds, 2 steals). — Loyola had no trouble beating Mather 87-42 on Jan. 13 in Day Three of the Loyola MLK Tournament. The Ramblers (16-2), who extended their win streak to 10 games, were paced by Connor Barrett (20 points), Vahe Kalayjian (10 points, 5 rebounds, 4 assists, 3 steals), Kevin Cunningham (8 points, 5 rebounds, 10 assists), Barrett Kwiecinski (7 points, 6 rebounds), Jordan Kwiecinski (6 ponts) and Will Bodkin (6 points). — Lake Forest continues to come close. But, once again, the Scouts were unable to pull out a win on Jan. 12, when they dropped a road game at Zion-Benton 44-40. Two players, Ben Gibson and Jake Fisher, scored in double figures for the Scouts (5-11, 0-4). Gibson tallied 18 points to go along with five rebounds. Fisher finished with 13 points while he added three assists. Mead Payne ended up with nine rebounds for the Scouts. — Sparked by Kevin Cunningham’s 16 points, Loyola Academy took down visiting DePaul Prep 48-38 in Chicago Catholic League Blue Division action on Jan. 12. It was the ninth win in succession for the Ramblers (14-2). Cunningham also had six rebounds and four assists. LA’s other stat leaders were Peter Mangan (11 points, 5 rebounds, 3 steals), Connor Barrett (11 points) and Barrett Kwiecinski (5 points, 4 assists). Ziv Tal poured in 24 points to spark Highland Park to a 47-40 victory over visiting Glenbrook North in a key CSL North contest on Jan. 9. HP improves to 4-0 in league play and 8-6 overall. GBN moves to 3-1 in the CSL North and 10-5 overall. Tal tallied 11 points in the second frame to give HP a 10-point advantage at halftime, 27-17. The Giants then increased their lead to 14 points, 33-19, on a free throw by Tyler Gussis (7 points) with 5:31 left in the third quarter. But GBN didn’t go down without a fight. The Spartans closed out the third quarter on an 8-0 run. The game tightened even more in the fourth quarter, when GBN’s Sean Merrigan hit two free throws with 51 seconds left to make it a two-point margin. “We fought back. We had our chances,” said GBN coach David Weber. HP put the game away at the end by going 5-for-6 at the foul line. Noah Shutan (9 points, 5 rebounds, 5 assists) hit 3 of 4 from the stripe, while reserve guard Andrew Natinsky went 2-for-2. Max Knebelkamp led Spartans with 11 points. The senior guard also had five rebounds and seven assists. Kellen Witherell had 10 points and four rebounds, while Merrigan had seven points and three assists. — New Trier junior Ciaran Brayboy tipped in a shot just before the buzzer went off to give New Trier a thrilling two-point win, 60-58, over visiting Niles North on Jan. 9. It was the first loss of the season for the Vikings (13-1, 3-1). It was Brayboy’s night. The 6-foot-9 center closed out the game with a team-high 19 points. Griffin Ryan (12 points) and Andrew Kirkpatrick (11 points) also were key scorers for the Trevians (10-2, 4-0). — Following its 43-35 setback to visiting Maine South on Jan. 9, much-improved Glenbrook South slipped to 0-4 in the CSL South. The Titans (6-9) received nine points apiece from Gavin Morse and Mac Hubbard. Loyola notched its 14 win of the season by downing host St. Viator 52-49 in the second round of the MLK Tournament on Jan. 8. The 14-2 Ramblers were led by Kevin Cunningham (23 points, 5 rebounds, 4 assists), Peter Mangan (14 points, 14 rebounds), Connor Barrett (6 points), Barrett Kwiecinski (6 points) and Jordan Kwiecinski (5 rebounds, 2 blocks). — Highland Park hit the road and came up short against host Moline High School 44-38 on Jan. 6. Daniel Michelon and Ziv Tal tallied 12 points each for the Giants (8-6, 3-0). Noah Shutan came up with five assists and four rebounds. Jonny Koenig had five points and three assists, while Tyler Gussis had four points and six rebounds. — In the opening round of the MLK Tournament on Jan. 6, host Loyola took down Lakes 52-35. Connor Barrett (19 points) and Kevin Cunningham (10 points, 4 rebounds, 4 assists) paced the Ramblers, who improved to 13-2 overall. — Ben Gibson had another productive outing but it wasn’t enough. 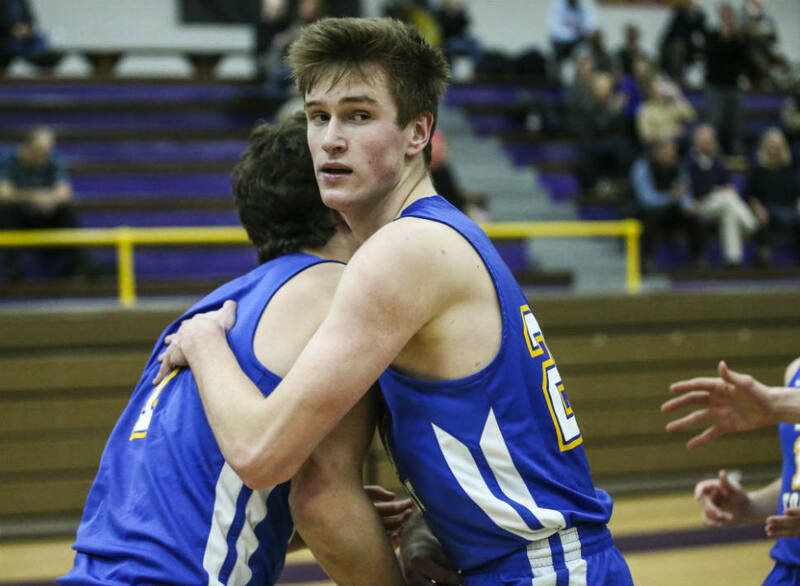 Despite a 17-point performance by the senior, Lake Forest dropped a 53-43 decision to visiting Lake Zurich on Jan. 5. The Scouts (5-10, 0-3) were outscored 35-24 in the second half. LF’s other stat leaders were Mead Payne (7 points, 3 rebounds, 3 assists) and Sean Trkla (7 points, 3 rebounds). — Junior Connor Barrett led the way as Loyola picked up a 57-41 road win at Mount Carmel on Jan. 5. Barrett poured in 22 points as the Ramblers improved to 12-2 overall and 2-1 in conference play. Barrett also pulled down eight rebounds. LA’s other stat leaders were Kevin Cunningham (12 points, 5 rebounds, 5 assists, 3 steals), Peter Mangan (11 points, 5 rebounds, 4 assists), Jordan Kwiecinski (7 points, 4 assists) and Barrett Kwiecinski (5 rebounds). Couldn’t have gone any better — for Loyola Academy. For the second year in a row, the Ramblers captured the top prize in the Gulfcoast Holiday Hoopfest in Naples, Florida. The team edged Deerfield Beach 53-50 in the title game on Dec. 30. Senior guard Kevin Cunningham and junior guard Connor Barrett were recognized for their efforts. Cunningham was named the tourney MVP. He was good on 16 of 30 from beyond the arc in the four-game set and ended up scoring 17 points per game. He also averaged four steals, four rebounds and four assists per game for the 11-2 Ramblers. Barrett hit 11 threes in the four games and averaged 14 points per game. In the title game, Cunningham tallied 23 points while Barrett added 18. John Lynch and Pete Mangan had four rebounds each, while Jordan Kwiecinski had four assists. On Dec. 29, in a semifinal game, LA topped Lehigh 47-41. The stat leaders were Cunningham (14 points, 5 rebounds, 4 steals), Barrett (7 points), Bennett Kwicienski (7 points), Mangan (6 points, 5 assists), Vahe Kalayjian (6 points) and Patrick Russell (4 rebounds). Barrett tallied 24 points to pace the Ramblers past Palmetto Ridge 46-35 on Dec. 28. The other stat leaders were Kalayjian (6 points, 6 rebounds, 4 assists), Jordan Kwiecinski (6 points), Mangan (7 rebounds), Lynch (6 rebounds), Bennett Kwiecinski (4 assists) and Cunningham (4 steals). In the opening game on Dec. 27, Loyola took care of Lely 49-33. Cunninham (22 points, 3 steals), Jordan Kwiecinski (6 points), Mangan (7 rebounds, 5 assists) and Bennett Kwiecinski (3 steals) led the way. — Glenbrook North ended the Hinsdale Central Holiday Classic on a good note. Kellen Witherell dropped in 20 points to lead the Spartans to a 54-37 over Westinghouse on Dec. 30. The senior forward went 4-for-5 from beyond the arc. He also had a team-high five rebounds. GBN also received strong performances from Frank Siegien (12 points, 7 rebounds, 4 assists), Evans Barnes (10 points) and Max Knebelkamp (10 points, 3 assists, 3 steals). The Spartans (10-4, 3-0) finished 2-2 in the four-game set. After losing to Rockford Auburn 50-40 in the tourney opener on Dec. 27, they slipped past Urban Prep Englewood 49-46 on Dec. 28. In Day Three action, they came up short against Marian Catholic 61-54. In the win over Urban Prep, GBN was led by Barnes (14 points, 7 assists), Siegien (11 points), Knebelkamp (8 points, 2 assists) and Brian Johnson (7 points). In the game against Auburn, Siegien (12 points, 10 rebounds), Witherell (11 points) and Knebelkamp (9 points) led the way. And, in the loss to Marian, GBN’s stat leaders were Witherell (16 points, 7 rebounds), Barnes (12 points, 2 assists), Knebelkamp (11 points, 5 assists, 3 steals) and Siegien (11 points). — Glenbrook South wrapped up play in the Wheeling Hardwood Classic by downing Geneva 54-47 on Dec. 30. The Titans (6-8, 0-3) wound up with a 3-1 record in the four-game set. Junior guard Will King was named to the all-tournament team. For first-year head coach Phil Ralston, going up against Geneva had extra meaning. Ralston coached the Upstate Eight school for nine seasons (193-77). GBS led the Vikings 27-18 at halftime and used an 18-point fourth quarter to seal the win. Mac Hubbard of the Titans led all scorers with 18 points to go along with six rebounds. Jimmy McMahon pitched in with 13 points, while the team also received solid work from King (9 points, 6 rebounds, 3 assists) and Gavin Morse (8 points, 4 rebounds). Glenbrook South, which opened first-round play with an overtime win over St. Viator 63-58 on Dec. 27 (See Recap Story), fell to Waukegan 78-76 in the quarterfinals on Dec. 28, while the Titans took care of Fremd 37-32 on Dec. 29. Against Waukegan, the Titans were led by Dominick Martinelli (18 points, 4 rebounds), Morse (17 points, 5 rebounds), Hubbard (16 points, 5 rebounds) and McMahon (11 points, 4 assists). McMahon was GBS’s top scorer against Fremd with 10. The other stat leaders were King (9 points, 8 rebounds), Morse (5 points, 10 rebounds, 3 assists), Hubbard (5 points) and Martinelli (4 points, 4 rebounds). — New Trier finished action in the Proviso West Holiday Tournament in strong fashion, when the Trevians (9-2, 3-0) topped CICS Longwood 76-47 in a consolation-bracket game on Dec. 30. Four NT players ended up in double figures: Ciaran Brayboy (12), Sam Silverstein (11), Spencer Boehm (10) and Griffin Ryan (10). Brayboy added 10 rebounds, while Boehm pulled down four boards and made two steals. Andrew Kirkpatrick came up with eight points, eight assists and three assists. Other stat leaders included Noah Osher (7 points, 2 steals), Brian Conaghan (6 points, 2 assists), Matt Samuelson (6 points), Andrew Kost (4 points, 5 rebounds) and Matt Mosher (3 steals). New Trier opened the tourney falling to Hillcrest 49-41 on Dec. 27. Then, the Trevians dropped a 62-61 decision to St. Joseph in the consolation bracket on Dec. 28. Against Hillcrest, NT was led by Boehm (12 points, 6 rebounds, 2 blocks), Conaghan (10 points), Brayboy (9 points, 9 rebounds, 3 blocks) and Kirkpatrick (9 points). And in the loss to St. Joseph, Kirkpatrick (21 points, 3 assists), Brayboy (18 points, 9 rebounds) and Boehm (11 points, 5 rebounds, 2 steals) led the way. — Despite having four players score in double figures — Evan Barnes (15), Mike Roane (12), Kellen Witherell (10) and Max Knebelkamp (10) — Glenbrook North came up just short against host Buffalo Grove 61-59 on Dec. 22. Roane led the team in rebounds (6). Barnes had three assists. — Jack VanHyfte had his best scoring performance of the season. But it was enough. VanHyfte tallied 20 points in Lake Forest’s home loss to Deerfield 46-45 on Dec. 16. The senior guard hit six of nine shots from beyond the arc. The Scouts (3-6, 0-3), who lost their fourth straight game, were outscored 18-12 in the final eight minutes. With the win, Deerfield improved to 4-6 on the season. Senior Ben Gibson also finished in double digits (11 points). He also had three rebounds and two assists. 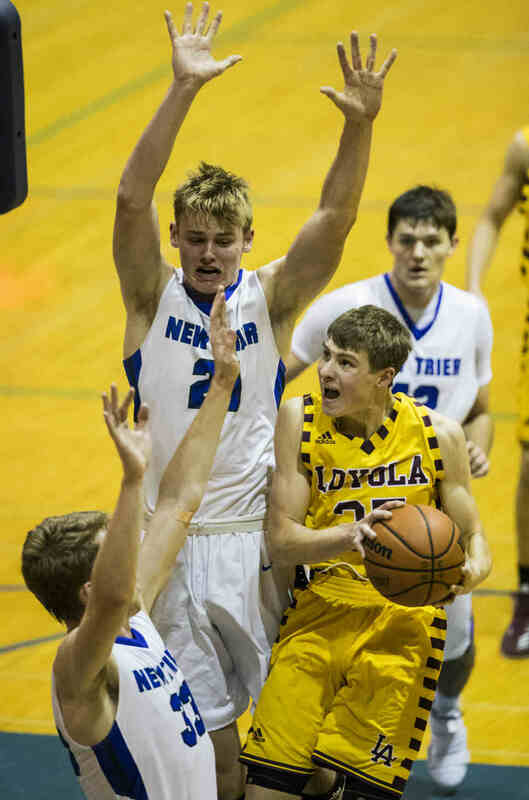 — Loyola traveled to St. Rita on Dec. 15 and saw its four-game win streak come to an end. The host Mustangs won the game 33-30. The Ramblers (6-2, 0-1) were led by Kevin Cunningham (14 points), Connor Barrett (14 points) and Pete Mangan (6 rebounds, 4 steals, 2 assists). — Mac Hubbard tallied 21 points as Glenbrook South earned a road win over Warren 49-41 on Dec. 15. GBS improved its overall record to 3-6. — Paced by Daniel Michelon (12 points, 4 rebounds, 2 assists), Ziv Tal (12 points, 3 rebounds) and Jonny Koenig (11 points, 2 assists), Highland Park earned a nonconference win over visiting Dundee-Crown 46-40 on Dec. 12. Tyler Gussis (5 points, 6 rebounds, 2 steals) and Noah Shutan (5 points, 8 assists, 3 rebounds) also helped the HP cause. — They were dead even after the first 32 minutes. But the overtime period belonged to host Libertyville on Dec. 12. The Wildcats outscored Lake Forest 12-7 in the extra session to claim a 65-60 victory in NSC play. LF (3-5, 0-3) was led by Ben Gibson (22 points, 7 rebounds) and Sean Trkla (16 points, 7 rebounds, 5 assists). Mead Payne had six points and four rebounds, while Tommy Hanson came up with six points and four rebounds. — New Trier kept its unbeaten record intact by downing visiting Lake View 71-35 on Dec. 10. The Trevians are 7-0 on the season. — They played big on the big floor. In a game played at the United Center on Dec. 9, Glenbrook South topped Hersey 42-38. The win snapped a three-game losing streak for the Titans (206, 0-2). Guard Will King led GBS with 17 points. — Junior center Ciaran Brayboy popped in 22 points to pace New Trier to a 69-54 victory at Niles West on Dec. 8. Senior guard Andrew Kirkpatrick also came up big, tallying 18 points for the undefeated Trevians (6-0). Spencer Boehm and Griffin Ryan pitched in eight points each. — Twelve different players scored as Highland Park raced past host Maine East 68-30 on Dec. 8. The Giants (2-4, 2-0) were led by Daniel Michelon (13 points, 4 steals, 2 assists), Ziv Tal (12 points, 3 steals, 2 assists), Tyler Gussis (8 points, 3 steals), Noah Shutan (8 points, 6 assists, 5 steals) and Lucas Fleisher (7 points) and Ethan Goldberg (6 points, 6 rebounds). — Loyola Academy improved to 5-1 overall with a 49-32 win over visiting St. Francis on Dec. 8. The team was led by Connor Barrett (14 points), Pete Mangan (7 points, 5 rebounds, 4 assists), Bennett Kwiecinski (6 points, 4 rebounds), Patrick Russell (5 points, 4 rebounds) and Kevin Cunningham (6 points, 5 assists, 4 steals). — Ben Gibson tossed in 19 points and grabbed seven rebounds, but it wasn’t enough. The Scouts (3-4, 0-2) fell 10 points short against visiting Warren 52-42 on Dec. 8. LF’s other stat leaders were Sean Trkla (8 points, 3 assists, 3 rebounds), Jack Van Hyfte (8 points) and Jake Fisher (5 points, 2 assists). — Highland Park picked up its first road win of the season by downing host Maine East 68-30 in CSL North action on Dec. 8. — Glenbrook South dropped a hard-fought 60-48 decision to host Niles North on Dec. 8. 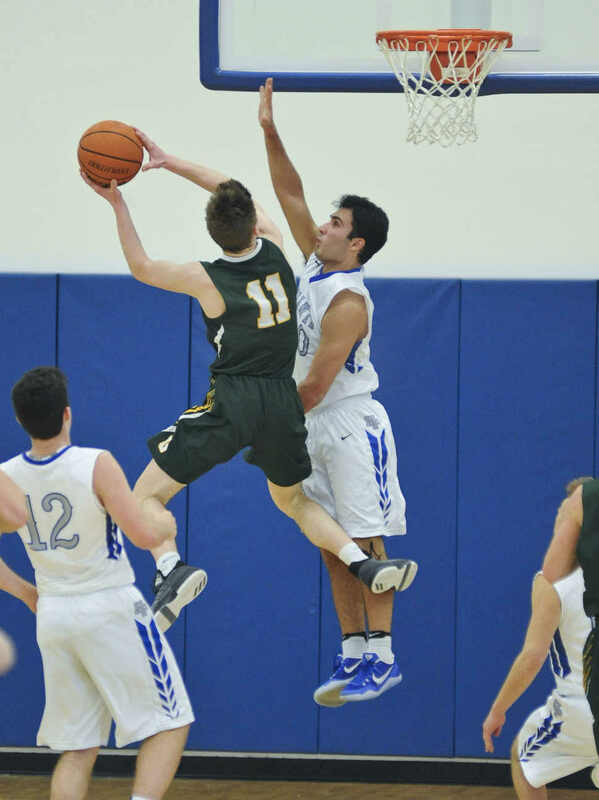 — Glenbrook North jumped out to a 22-8 first-quarter lead and breezed to a 30-point win over visiting Vernon Hills 73-43 on Dec. 7. The Spartans are now 7-0 on the season. Four GBN players scored in double figures: Evan Barnes (13), Max Knebelkamp (13), Kellen Wetherell (12) and Frank Siegien (10). The team’s leading rebounders were Alex Press (7) and Mike Roane (5). Knebelkamp had five assists, while Wetherell came up with three steals. — Jed Thomas and Ben Gibson turned in solid work, but it wasn’t enough. Lake Forest dropped a 45-35 decision to visiting Stevenson in a North Suburban Conference opener on Dec. 5. Thomas hit three three-pointers to finish with 13 points. Gibson also tallied 13 points to go along with a team-high 10 points. Jack Van Hyfte had five points and three rebounds for the Scouts (3-3, 0-1), while Mead Payne had two points, five rebounds and two assists. — This time, it was Evan Barnes leading the way. Glenbrook North remained perfect on the season (6-0) with a 54-43 victory over host Glenbrook South on Dec. 2. Barnes, a senior guard, had his best game of the season, tallying a game-high 21 points with three rebounds and two steals. He connected on 4-of-8 shots from beyond the arc. He went 7-for-8 from the foul line. The Spartans also received solid contributions from Brian Johnson (9 points, 5 rebounds, 4 assists), Sean Merrigan (8 points, 3 rebounds, 3 assists), Frank Siegien (8 points, 5 rebounds), Kellen Witherell (5 points) and Max Knebelkamp (7 assists). GBS (1-5) was paced by Dom Martinelli (9 points), Will King (8 points, 3 assists, 2 steals), Yianni Mavrakis (8 points, 3 rebounds), Gavin Morse (5 points, 7 rebounds, 2 assists, 2 steals), Stefon Boyd (5 points) and Jimmy McMahon (5 points). — Three players scored in double figures as Loyola Academy downed host Marmion Academy 48-26 on Dec. 1. The Ramblers are now 4-1 on the season. The offense was paced by Kevin Cunningham (13 points), Vahe Kalayjian (13 points) and Connor Barrett (11 points). Senior John Lynch, who just completed his football season, went right to work. He ended up with five rebounds. Sophomore Jordan Kwienski also had five boards. Led by Andrew Kirkpatrick, Brian Conaghan and Spencer Boehm, New Trier kept its undefeated record intact (5-0) by downing visiting Maine South 63-56 on Nov. 30. Kirkpatrick finished the game with 18 points. Conaghan and Boehm scored 13 points each. Like the Trevians, Maine South came into the game with a 4-0 record. The Hawks took first place in the Lyons Thanksgiving Tournament. Lake Forest, which went 2-2 in the New Trier-Loyola Academy Thanksgiving Tournament, knocked off an undefeated team on Nov. 30. The host Scouts topped St. Viator 71-54. The Lions, who went 4-0 to take first place in their own Thanksgiving Tournament, were outscored 18-4 in the third quarter. LF (3-2) sealed the deal by putting up 24 points in the fourth quarter. Mead Payne paced the LF attack with 19 points, eight rebounds, two assists and two steals. Ben Gibson continued his solid start to the 2017-18 season by going 6 for 6 from the field to finish with 15 points. He added a team-high 11 rebounds. Junior Jake Fisher (12 points, 4 assists), Jack Van Hyfte (8 points), Sean Trkla (7 points, 2 assists), Jed Thomas (4 points, 6 assists, 5 rebounds, 2 steals) and Drew Arnson (4 points, 5 rebounds) also were key contributors. — Glenbrook North upped its record to 5-0 with a 54-52 overtime win over host Maine East on Nov. 30. The Spartans were Brian Johnson (15 points, 3 rebounds), Frank Siegien (10 points, 3 rebounds), Sean Merrigan (9 points, 2 assists, 3 steals), Max Knebelkamp (7 points, 2 assists), Mike Roane (7 points) and Evan Barnes (6 points, 4 rebounds, 2 steals). — Glenbrook South slipped to 1-4 on the season by falling to host Evanston 58-35 on Nov. 30.